Banat plain, Romania: evaluation of groundwater resources in the phreatic aquifer and their availability for any future necessities, taking into consideration the Programmes of Measures developed within the RBMP and based on the area socio-economic development. Selisoo, Estonia: the aim of the Estonian case study is to assess the effect of underground mining to a neighboring wetland water balance. Lavrion, Greece: this case study will focus on groundwater modeling tool in order to optimize the management of the local water resources of the karst aquifer for irrigation, combat seawater intrusion and minimize concentration of nitrates in the unconfined aquifer. Vrbanski plato, Slovenia: the Slovenian case study aims at evaluating the influence of city Maribor on aquifer and to look on possible pollution problems and solute transport. Lovosice, Czech Republic: this case study's objective is referred to Water Framework Directive, Groundwater Directive and Flood Directive. Bremerhaven, Germany: The German case study aims at predicting the impact of sea level rise and changing amounts of recharge due to climate change to the aquifer. Follonica aquifer, Italy: in Ithis Tuscan case study, researchers will develop and calibrate a numerical model in order to forecast the evolution of aquifers systems in response to different stresses such as variation in pumping rates, new input of contaminants, identification of the main path of contaminations and of the most vulnerable zones. Gozo island, Malta: this case study will support the assessment of the quantitative status of the Gozo Mean Sea Level Aquifer system and the development of projections of status assessment in response to future groundwater management and climate change scenarios. Lugano lake, Switzerland: FREEWAT shall support a better understanding of the lake load contribution from the groundwater so that new policies and actions can evantually be designed. 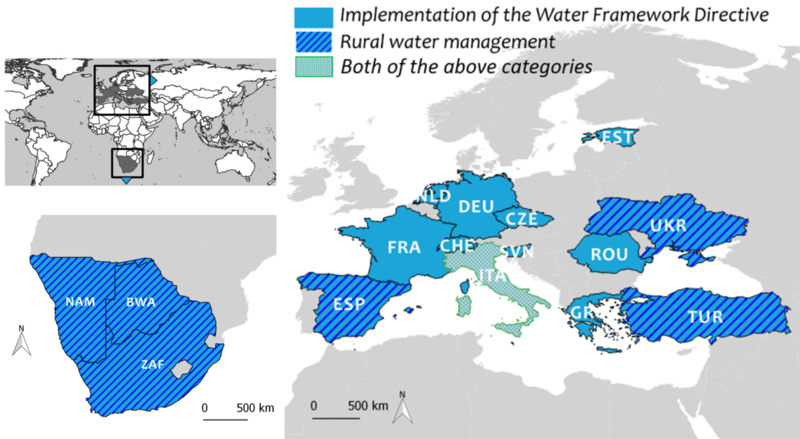 Massaciuccoli lake basin, Italy: The goal of the Massaciuccoli Lake case study in the FREEWAT project will be that of forecasting scenarios for a better management of water in the agricultural areas nearby the lake. Several ideas on scenarios to be simulated already arose during the four Focus Groups run, where stakeholders from various sectors are participating and discussing the modelling activities. Navarra, Spain: The scope of FREEWAT is to evaluate the reliability of actions programs, estimating nitrates concentration and comparing simulation results with the existing monitoring network and finally suggesting improvements. Bakumivka river catchment, Ukraine: the case study is aimed at seeking the optimal ways of water and land management in the areas heavily modified by the hydro-melioration. Palas basin, Turkey: the FREEWAT objective is to develop a watershed model for the Palas Basin in Turkey. Stampriet, Africa: the model that will be developed within the framework of FREEWAT in straight collaboration with the Governments of Namibia, Botswana and South Africa will allow identifying knowledge gaps that still exist on various aquifer aspects, and will be crucial to decision-makers of the STAS countries for monitoring/managing the aquifer.